For the past couple of months I have been working solely on my kitchen…and I’m over it. I still have a few projects left on my list, but it’s time to move on*. I’ll come back to the kitchen in a few months, but I’m ready to start working on the living room and the office. *Note: I already bought a new kitchen faucet, so once that’s installed; I’m ready to move on. As of now, it’s not functional for two people and it’s not meeting our needs. Because there isn’t enough space to work in this room (my boyfriend’s legs don’t even fit comfortably under that desk), it’s become a junk room. And actually, that’s cleaner than it’s been in awhile. Thanks to our garage sale and a recent trip to Goodwill, you can actually see the floor and use the treadmill. I know I’ve been talking about painting stripes on the walls forever, but now I’m actually going to do it. I know it’s going to look amazing in there. For the office part of the room I want to find a long (but not too wide) dining table. That would give each of us our own desk space and we wouldn’t have to stack our laptops anymore. We would still need some storage, so I love the idea of a file cabinet painted a fun color. Above the desk I want to mount my small TV and create a gallery wall around it. One side of the gallery wall would be filled with things I love (above my side of the desk) and the other side would be filled with stuff my boyfriend likes (above his side of the desk). As much as I’d like not to have the eyesore treadmill in there, I like being able to fit into my clothes, so it’s staying. 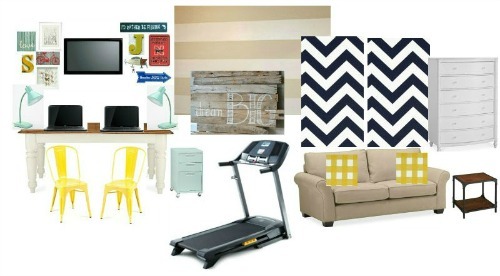 I’m going to fill the large wall with a large DIY pallet art piece. Also, I want to put a sleeper sofa in front of the window. I love the idea of being able to lounge and watch TV, but also have extra room for guests. I also want to replace the curtains and find/build an end table that can double as a nightstand. And finally, on the smaller wall (next to the closet) I want to add a dresser for storage. 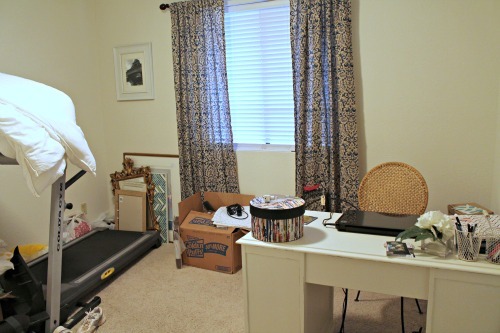 Hopefully we can use that to hide all of the junk this room accumulates. You can never have too much storage! Love the sleeper sofa, I actually got mine off of JCPenney.com for super cheap though they are HEAVY. Also love desk. And lamp. And chairs. Yay! Can't wait to see it! Whoooo!!!!!!!! ** meant I did the DARK color first. That's right, move on to another room and swing back around to the kitchen when you are feeling the love. I love your mood board. Can I say that I am impressed that you use your treadmill? I gave ours away years ago....who am I kidding? This looks like fun!! And I love the chevron in your mood boards. Seriously, I have become obsessed!! :) I feel like you're almost done with your kitchen, you've gotten so much done! I like how you're making the list of things to accomplish - I'm sure that actually helps make sure they get done. I thought about making a list to put on my blog too...but right now that seems like too much pressure! ha. I'm excited to see what this room will end up looking like!! Love that you're keeping it real. Treadmill makes the cut!